October 19 – An eagerly awaited meeting between high-ranking FIFA officials and Sierra Leone’s warring football factions has failed to produce the necessary breakthrough and provide a clear way forward. 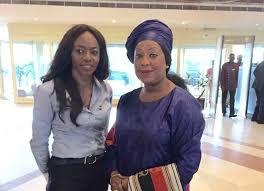 Earlier this week Sierra Leone’s Sports Minister, Ibrahim Nyelenkeh, accused the country’s FA president Isha Johansen (pictured left with FIFA general secretary Fatma Samoura) of being personally responsible for FIFA shutting down the federation despite on-going criminal investigations into its leadership. FIFA cited “government interference” as the reason for last week’s suspension but Nylenkeh said Johansen, who was removed because she was being investigated by the country’s Anti-Corruption Commission, was instrumental in FIFA’s decision and insisted she would not be re-instated. To try and resolve the impasse and find an amicable pathway that could lead to FIFA lifting the ban, a delegation flew to Zurich Thursday representing both sides of the dispute including Johansen and Sierra Leone Attorney General and Minister of Justice, Priscilla Schwartz. Under the suspension the SLFA cannot play in international competition and it was hoped some clarity could also be brought to bear in terms of the Africa Cup of Nations qualifying double-header between Sierra Leone and Ghana, called off by the Confederation of African Football less than 48 hours to the first game was due to take place. But this was not resolved either. Instead a compromise of sorts was reached. Both Johansen and Kamara have long been embroiled in a bitter power struggle but deny any wrongdoing. Johansen claims she is the victim of trumped-up charges designed to stop her carrying out an inquiry into match-fixing and corruption allegedly perpetrated by high-ranking opponents. But her mandate as president came to an end over a year ago and no fresh elections have yet taken place.